Using Our Old Version? 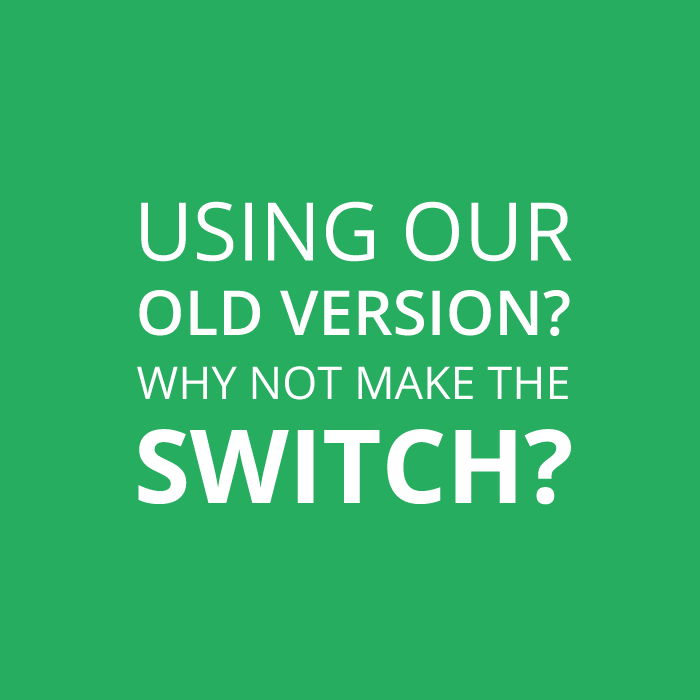 Why Not Make the Switch? You may have noticed some changes with our login page. We'll also be rolling out a new website and videos within a few weeks (if not sooner). Please be aware we'll be removing login links to the old version from our main website. This should happen at the end of December. Although you are welcome to continue using our old version (we will still support it), Webtimeclock will be focusing on our latest version. If you haven't moved, PLEASE tell us why. Did you know we have a new version? We've learned that many of you do not even know about Webtimeclock 3. And for those that do know, there's been confusion and questions. Hopefully this post will help. Are you closing the old version? Simple, signup for our Free 15 day trial and start using it. When you're ready, we'll stop billing on your old account and give you free access to your old data. NOTE: We don't automatically know when you decide. Please let us know. No, instead we'll give you free access to your old account. That way, you can access your old data using the familiar interface. We are more than happy to help you move, we want it to be as easy as possible. Let us know. Is Webtimeclock 2 going away? No, you may still use it, however we stopped development. Keep in mind, login links will be removed from our main website by the end of the year. What's Different about Webtimeclock 3? Although we maintain our easy-to-use design, we've made it a lot more productive. Here is a list. Separate employee & manager logins Employees only need a PIN and a Company ID to log in for the first time. After that, they simply enter their PIN number. It can't get much easier than that. More accurate decimals Time is recorded in decimals (hundredths of an hour) instead of minutes. Now when you add down a column, your totals should match the column total. Job tracking Employees are now assigned to a job, as well as a department. Instead of department transfer, you can allow employees to clock in on different jobs, or switch jobs during the day. Universal tablet time clock You no longer need to buy special hardware. Turn any tablet into a time clock. Employees clock in using a 4 digit pin number. Geolocation If desired, you can require employees to record their GPS coordinates each time they clock in or out. Works with web clocking, app clocking, and text clocking. You can view a map of that location in the manager. Date range reporting You can now run reports on any date range you wish. Timecard approvals Timecards can be approved by multiple administrators or supervisors, and by the employee. Timecards can also be locked from any further edits. Telephone clocking The system recognizes the calling phone. If it's a team phone, the employee is asked to enter their PIN number. If it's the employee's phone, no PIN number is needed. Text clocking The system recognizes the employee's texting phone number. No need to enter a PIN number. If you want, employees can be required to verify their GPS location. Time off accruals PTO, vacation, and sick hours can now be accrued daily over a year. Or by number of hours worked. Both in real time. IP security We've simplified how employees are limited to IP addresses. If an employee is outside their approved network, they can still log in, but won't be able to clock in or out. Instead they will be alerted why. Custom Pay Period Along with weekly, bi-weekly, semi-monthly, and monthly periods, you can now select a custom date range. Audit reporting Clocking events and edits are permanently recorded. We now have special reports that detail what happened, when, and by whom. Making webtimeclock DCAA compliant.